Is mapping technology just a tool? This was a central question in many of the readings this week. Are mapping technologies, or indeed any other type of visualization technology, just tools? If they are how can we or how should we use them for our research? This question goes back to our initial debate about the role of intuition, and if these technologies are merely tools used by humanists to evaluate their research and whether they can ever replace human intuition or interpretation. As Bodenhamer usefully summarizes, “humanities GIS is a powerful tool…It aids but does not replace expert narrative: it finds patterns, facilitates comparisons, enhances perspective, and illustrates data…In this view, GIS provides geographical context and depth to an expert interpretation of the past” (Bodenhamer 28). Benjamin discuss the ways in which history can become totalizing and mask individual experience. Similarly, Bodenhamer highlights the ways in which GIS is particularly suited for large data sets and the ways in which it is useful for recognizing patterns and creating overarching narratives. In this way, mapping technologies do not yet account for the role of the individual in history, and particularly individual experience. What are some ways that we can use maps or other tools to better capture or represent both individual and collective experience? Will there always be a tension between the general and particular or ‘total’ histories/narratives and individual histories/narratives? Bodenhamer’s critique of GIS on page 23 identifies the core issues for humanists in using mapping technologies: how can humanists use these technologies to “represent the world as culture and not simply mapped locations?” (Bodenhamer 23). 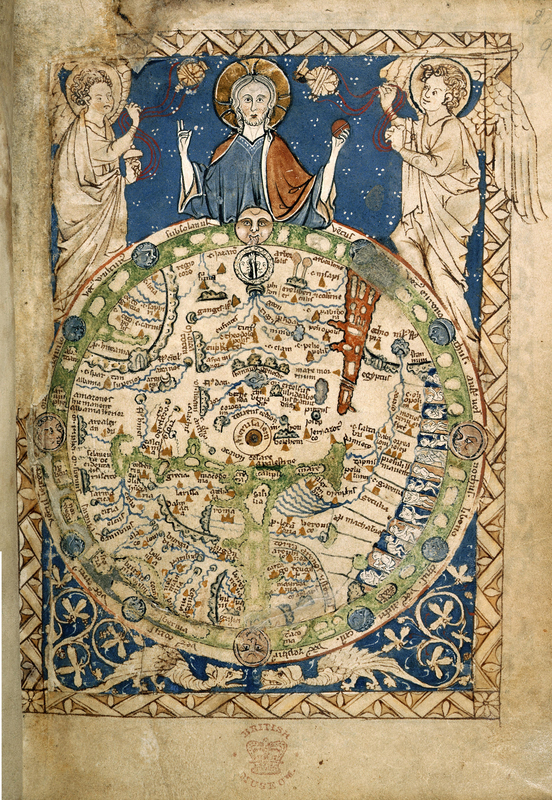 Below is an image of the thirteenth-century “Psalter World Map.” I believe the questions that we ask of this map are not and should not be any different than those we ask of modern maps or visualizations, namely how is this map a social construction and how does this map represent a particular perspective (social, political, economic, religious, ect..)? How does this map represent both individual and collective experiences of the world? Also, how can we think critically about this map, not just as a physical or objective space, or in Bodenhamer’s words “a physical environment stripped of its cultural assumptions” (16-17)? Perhaps we have become accustomed to think critically about a map from the past – why are we not as critical when we see a medieval history or world view plotted on a google map? Are there ways to portray the experiences and histories of the past accurately using modern technologies?